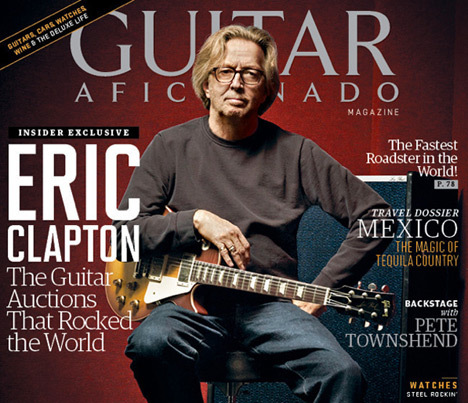 The December/January issue of Guitar Aficionado features Eric Clapton on the cover and a look at some of the iconic guitars auctioned by Eric Clapton for his Crossroads Centre. The issue is still on the newsstand where guitar magazine titles are sold ‘en mass so if you don’t have this one…run, don’t walk, to your closest Barnes and Noble. Read more of the Eric Clapton story by [CLICKING HERE]. Are you an Eric Clapton fan? Be sure to check out Creative Bone Artworks, and all of the incredible prints in the “Art That Rocks” Collection – specifically the Eric Clapton print from world-famous artist Tom Noll! Tom’s “Art That Rocks” print collection includes Limited Edition prints from original oil paintings of many famous Blues and Rock guitarists and bands – available for immediate purchase! Limited Edition prints are still available of this amazing Eric Clapton artwork! Contact Tom Noll directly to inquire about ALL art prints for sale.